Philips has teamed up with the audio experts at Bowers & Wilkins to create a TV with audiophile-quality sound. Launched at IFA 2018 in Berlin, the Philips OLED+ 903 TV is designed to enhance dialog and reduce distortion. The TV's sound system uses Bowers & Wilkins' drivers throughout, all mounted within larger, more rigid enclosures than last year's . Amplification and overall power output have stayed the same as last year (50 watts), but Bowers and Wilkins has helped optimize the TV's speakers for punchier sound. The OLED+ 903 isn't just for movie buffs, either – Philips says the TV's bass performance has been significantly increased to give action films more oomph, but is still clean and accurate enough for discerning music fans. 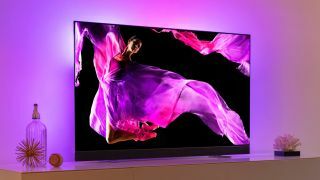 Philips has also given the OLED+ 903's visuals a welcome boost, with a new panel that's noticeably brighter than last year's model and a three-sided Ambilight system. Although high dynamic range (HDR) is becoming more popular, Philips accepts that most of the shows and movies you'll be watching are still in standard dynamic range (SDR), and has equipped the OLED+ 903 with its Perfect Natural Reality uses a smart contrast enhancement algorithm to give SDR content a similar punch to HDR. The TV will launch with Android Nougat, which is a little disappointing, but a planned update to Oreo will allow it to play nicely with both Google Assistant and Amazon Alexa. The OLED+ 903 TV is scheduled to hit stores in October, and will be available in both 55-inch and 65-inch models. Prices are yet to be announced, but we'll keep you updated once we know more. This is only the first fruit of Philips' partnership with Bowers & Wilkins, so we expect to see more of the audio company's tech appearing in sets soon.